Today’s Blog Tour Stop is Sinfully Gay Romance! Enter to win a $20 gift certificate from an e-tailer of your choice at each blog site AND from these winners, ONE person will be chosen be a character in my other Los Angeles series, Murder and Mayhem. So hit up every blog, enter to win! ONE winner per blog for the certificate, one grand prize winner chosen from those winners! Former LAPD detective Cole McGinnis’s life nearly ended the day his police partner and best friend Ben Pirelli emptied his service weapon into Cole and his then-lover, Rick. Since Ben turned his gun on himself, Cole thought he’d never find out why Ben tried to destroy him. Years later, Cole has stitched himself back together. Now a private investigator and in love with Jae-Min Kim, a Korean-American photographer he met on a previous case, Cole’s life is back on track—until he discovers Jeff Rollins, a disgraced cop and his first partner, has resurfaced and appears to be working on the wrong side of the law. As much as Cole’s fought to put the past behind him, he’s soon tangled up in a web of lies, violence, and death. Jeff Rollins is not only trying to kill Cole’s loved ones, he is also scraping open old wounds and long-forgotten memories of the two men Cole loved and lost. Cole is sure Rollins knows why Ben ruined all their lives, but he isn’t looking for answers. Now Cole is caught in a cat-and-mouse game with a cold-blooded killer with the key to not only his past but his future. And other fine ebook retailers. 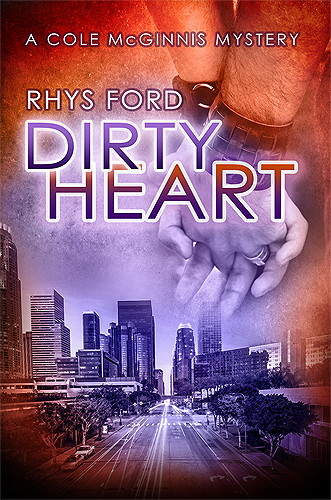 Dirty Heart Blog Tour Stop #5 is at It’s All About The Book and the Scene is…Jae & Claudia. It’s always hard to say goodbye and these guys will be missed.